"What about an article on the collapsing (and totally filthy) RI subway station?" a reader asked, reminding me I'd planned to write about the mess but put it off as other news came up. Like many of my neighbors, I'd gotten used to it, disgust displaced by grudging acceptance. Note: Recent shutdowns of the Roosevelt Island station have been caused by infrastructure failures. This article is about more obvious failures in visible upkeep, but its reflection of the general state of neglect from which subway riders struggle makes it relevant. It may not be completely fair or accurate to compare the Roosevelt Island F Train Station with a Third World outpost. I've seen only a Second World subway system. That was in Prague, but it was so much cleaner and better maintained than New York's, I used it as a guide. See a photo gallery designed to accompany this article. Travel where you will, you're unlikely to see an uglier mess than what Roosevelt Islanders walk - or slide - through every day, just to access an underground public transit system. Criticize the filth and neglect in our subways and count on being treated to a chorus of excuses about how it's too expensive to keep clean and, after all, it's the fault of riders, really. They bring food on the trains and discard it and other trash carelessly. It's as if we're conditioned to blame everyone but the real culprit: the MTA, which simply never budgets enough for upkeep. Look at it this way, Midtown sidewalks, pounded by many, many more footsteps and subject to constant traffic and all kinds of weather, are much nicer. And safer. Because the people who use and profit from them give a damn about the conditions. Anyone who falls for officials crying poor in the urban center of sky-scraping towers, international banking and stock trades fails the reality test. We've got the money. What we don't have is the will or the values. We're so used to the mess, we take it in stride, or as necessary, we walk around it. And to be utterly truthful, most of those who should be coughing up cash for the system that delivers their workers from all over town and hikes the value of their rental properties don't see a subway platform often enough to care. The first thing that appalled me, after moving to New York and becoming dependent on mass transit, was how easily New Yorkers accept the grunginess of stations attached to popular tourist magnets. Grim conditions steps outside Bloomingdales were an eye-opener for what we're conditioned to tolerate after decades of incompetence. Since then, over twenty-five years, I've watched our Roosevelt Island station fall to the same negligence that plagues the rest of the subterranean city. The first time my wife and I set foot on Roosevelt Island, we tagged along with a group led by Adventures on a Shoestring, an ingenious outfit that organized walking tours to unexpected places. As far as I know, they still do. We rode the Tram over and soon strolled by the "newest station in the subway system." Its entrance didn't look at all like the stairways that suggest descending into dungeons on street corners all around Manhattan. It was enclosed with a lot of glass, and it was airy with natural light. We didn't take a ride that day, but a year later, we'd settled into Manhattan Park and ditched cars that were mandatory in New Jersey. Although the Q, which then ran along 6th Avenue and terminated at 21st Street/Queensbridge, did not live up even to the standards of reliability we get with the so-so F Train today, it was our artery to the city for work and entertainment, more versatile than the Tram. And the station was new, shiny and bright with reflective metal surfaces contained under high ceilings. No industrial I-beams bracing low ceilings with paint peeling like slices of scraped paper. Escalators were sensory activated, efficiently springing into action when you stepped on a pad to enter. 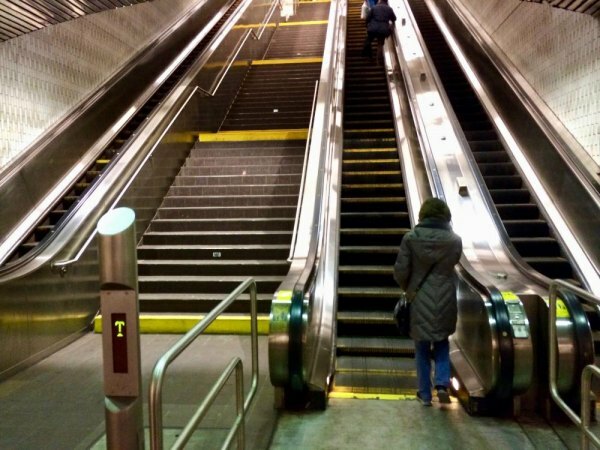 Okay, so the escalators broke down so often that the automated features had to go, and later, an extra set of moving stairs was added. The elevator was always an unseemly relic, tarnished with ingrained filth and the Q subject to unpredictable disappearances... Our station was still the newest and cleanest, which tells you something about the rest of the system. What went wrong with the Roosevelt Island station is what goes wrong with so many things government does. After the politicians puff out their chests to take credit for what you and I paid for and media attention fades, a municipal project's sexiness goes downhill fast. It's safe to assume that Andy Cuomo will not be conducting forceful meetings each week about keeping the 2nd Avenue Subway clean and neat, now that that party's over, but we've seen it before. The simple explanation for what went wrong with our shiny new station, circa 1991, is that the MTA predictably failed to plan for even routine maintenance, let alone the unanticipated demands of a tunnel that began leaking ground water, early on. It's a system-wide problem. You see it everywhere, except the very new stations on the 7 extension and the recent 2nd Avenue line. MTA's budget battles are like opera without music or heart, fluffed up with unanswered desires and hopes nearly lost. According to reports, the transportation system on which the city depends flirts with bankruptcy on an annual basis, barely able to keep trains and buses running and bridges and tunnels unclogged. Unlike opera, it never ends on a positive note. The politicians finally clatter to a settlement, one that's as inadequate as the one before and pushes the same old neglect into the future where, with any luck, it will be another administration's problem. Buck passing is a highly polished art where everyone walks away able to claim they sacrificed heavily (with our money) to keep the trains running one more day. And we should be grateful, they did so much for us. Especially on cloudy, rainy days, you notice how really bad the exterior looks, eaves rusted and bent, poured concrete discolored with weather and age, but there's an oddity that stands out from the rest: That strange pink door. I don't remember ever seeing it opened, but on the north front, a door with a washed out pink hue is embedded in an otherwise blank wall. There's nothing else matching it. It resembles a frozen exit ignored in some back alley, but it's not. It faces Main Street. I'm guessing, long ago, an optimist painted it Roosevelt Island red, fitting in with the once ubiquitous community theme. Exposed to the elements, it faded, no one bothering to scrape up the labor and paint for a fresh coat as its hue washed out to pink. As Roosevelt Island grew and prospered, our subway station went the other way. It reminds me of one of those pervasive link bait ads you see on the internet: "You wouldn't believe what (fill in the blank with a formerly popular celebrity's name) looks like now..."
Inside, MetroCard dispensers, which too often malfunction, block a front window although an unused wall remains available, and the token booth seems to serve no real purpose. Recycled wooden benches offer resting spots for waiting bus riders, but a number of separators have disappeared without replacement, leaving the polished wood looking cheap and broken. When the elevators fail, ugly yellow tape is wrapped around them, and service change notices, often handwritten in block letters, are posted on windows and walls with masking or duct tape. Riders can be thankful that the Gum Target, one of the MTA's spectacularly bad ideas, was short-lived, replaced with an anonymous art object. For those not living here long enough to recall or who, like my wife, have banned it from memory, a big round disc with a hole in the middle and bucket on the other side once tried to discourage discarding gum on subway platforms and floors by inviting riders to spit or toss it through the target into the disgusting bucket. You can't make these things up, but wouldn't you love to know who approved that charmer? Conditioned by the deteriorating lobby, its once vibrant red overhead piping now coated with years of dust and grime, you step onto an escalator that seems not to have had its treads cleaned since opening day. Black grit fills the grooves. The 63rd Street Station used to be like that until media attention fetched by its connection to the 2nd Avenue Subway scrambled maintenance workers into scraping out the grooves. This proves two things. One, the MTA knows what a clean station looks like, and two, they have no intention of giving us one. As you ride downstairs, you're guided by an endlessly repeating message telling you some minimally useful things about not letting kids play by the escalators and and avoiding sharp edges on the carelessly assembled sides, but you also get mysterious warnings about not putting "materials" on the escalators and banning pushcarts and pull carts. What century are we in? Pushcarts? And what genius approved a ban on "materials?" Did they intend to say "packages," but misplaced their thesaurus? Gliding toward the trains, you pass unexplained splatters of black substances you're wise not to investigate barehanded, but you can be confident they'll still be there if you decide to return with safety gear. Station messes have a long life underground on Roosevelt Island. And take a look at the vents near the base of the first escalator level. The bachelor apartment from which my wife rescued me had less dust. And before you leave the last deck for the trains, walk over to the balcony where you can get a view of the tracks below. Now, look up. It's not necessary to drive all the way upstate to Howe Caverns to see salt deposits built up to more than a foot in length by years of dripping water, dangling like icicles. Although we've watched the platforms go to hell over 25 years, I try look at them with a fresh eye, once in a while, to be objective and not so readily accept what we're stuck with. The worst, the most ugly part results from ground water leaking in, year after year, with no professional solution. It's as if the designers forgot that trains would run beneath the water table, although you'd imagine the river they passed by to get here might have jostled a thought. And what's worse is that all those years of leaking water means that the tunnel itself is breached. Anyone who deals with running water understands that erosion sticks to its mission. Redirecting leaked water into drain pipes will not reverse the damage. Solutions have ranged from "What the heck, it will go away by itself" to a Rube Goldberg of pipes that deliver drainage, somewhat ineffectively, to holes drilled into the platform tiles, apparently rerouting the fluids around the tracks on their inevitable way to middle earth. Ineffectiveness is evidenced by slippery, damp tiles leading to tiny rivulets worn into what were once orange strips laid down to warn waiting riders to stay a safe distance from the tracks. Black scale scars the walls in grim blotches that have lasted for years, even after the leaks were diverted. And gaping holes into a dark maze show us where the silver slats have been removed by repair teams and never replaced. Aside from the leaks, the dangers of slipping and general ugliness from which we're never relieved, there's the basic, day to day filth of the station. Because large, utilitarian garbage cans are plentiful, you seldom see waste on the platform although a few bags and other debris soak in standing water between the tracks, but the ground in filth and dust is ubiquitous. Having once supervised a crew that maintained a busy urban bus depot, I don't have much patience for explanations about how hard it is to clean a 24/7 public space. I've done it and with a lot more traffic and restrooms to boot. As a commercial enterprise, my company would have been fired if we maintained our facility as lamely as the MTA maintains our station. Standing water on tile platform within inches of the tracks? Soot build up for years, like black snow, on the red fluorescent light channels? Industrial construction lights strung for a hundred feet in replacement of failed permanent fixtures, not just for a few days, but weeks with no end in sight? We've got all that and more. It's a safe bet that, in personally overseeing completion of the rightfully celebrated 2nd Avenue Line, Governor Cuomo never once took an F Train one stop the other way to get a peek at what his MTA operation does on a regular basis. And that is, insult New Yorkers with filth and neglect. The whole mess is far more fixable that the politicians and career "officials" admit, and the media is also responsible for promulgating the poverty narrative. Here's a quick fact. When the first subway line opened in 1903, August Belmont ran it up from City Hall, financed by the Rothschilds. For a nickel, it was a luxury ride and profitable. Forty years later, politicians finally dared risk voter wrath with a fare increase. The simple fact is that, for most of us, the fares are not high enough to pay for what we're getting. If you take that first nickel and drag it through over a hundred years of inflation, it's still only $1.55. So, you'd think that fares should be lower, but they're not because of a dirty little secret you're never told when budget battles are being fought. That is, your current $2.75 fare pays for only about half of the cost of a ride because the subway system has been extended far beyond the original demand to bring riders from distant neighborhoods into and out of Manhattan. Those neighborhoods have fewer riders covering costs that get spread across the system. Poor planning and underfunding are as built into the system as are the third rails. One obvious solution is higher fares for longer rides, an answer that politicians will not address for fear of annoying voters. But voters need to be grownups too and recognize that the service we get today is reliant on a form of welfare and a damned unbalanced one at that. As suggested earlier, prime beneficiaries of widely extended subway service are the many businesses benefiting from workers commuting by train every day. Add to that the real estate investors who see the value of their buildings rise according the proximity of subway stations. Note to business owners and real estate tycoons: You get more and better workers and higher rents because we built you a subway. Pay your fair share. It's a discussion we never hear. It's time to hear it now. Please.